Are You A Guest Or A Pest? A picture is worth a thousand words and a wedding cost thousands of dollars; don’t ruin either by pulling out your phone or tablet. 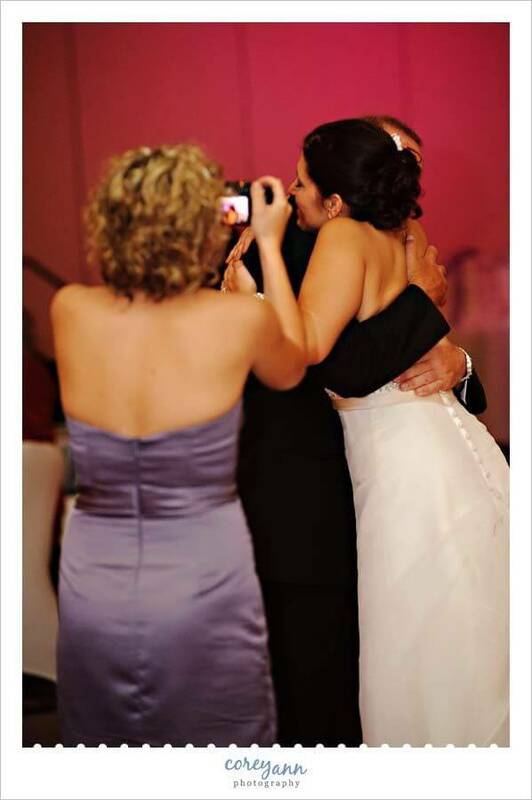 Weddings are more than worthy of the photo sharing and countless “likes” you may receive but we at Donnie Brown Weddings are putting our foot down against the photo bombers, snap-happy relatives, and phone addicts. Three words: MIND YOUR MANNERS! The work friend that leans in the aisle to snap a shot of the bride as she makes her grand entrance ruining the groom’s reaction picture…. The bridesmaid that walks on the dance floor to take a close up during the father/daughter dance. 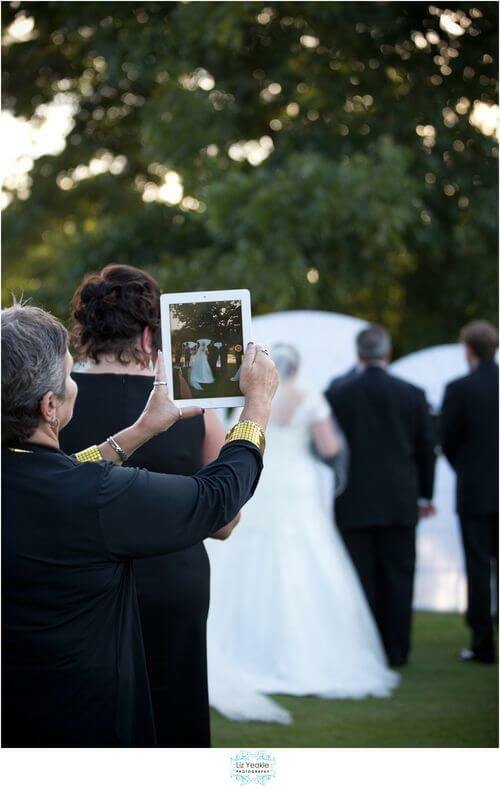 The out-of-town aunt that holds up her iPad to video the entire ceremony…. These people are among us; learn from their ghastly mistakes. Your attempt to capture the perfect moment of the newlyweds may seem in reach, but chances are your photography skills are novice at best regardless of Instagram’ s filter assistance so let’s not and say we did. 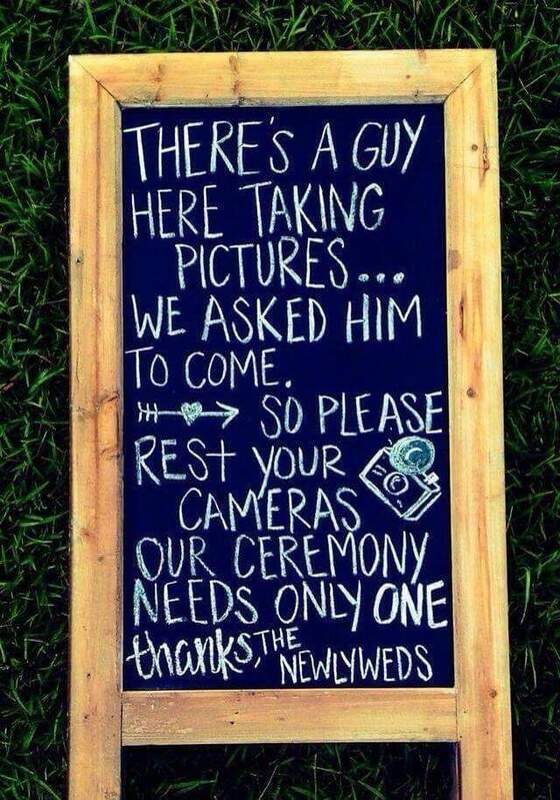 You wouldn’t refill your glass of water at a seated formal dinner (or here’s hoping) so relax, enjoy your pricey seat at your niece’s wedding, and leave the photography to the professionals. 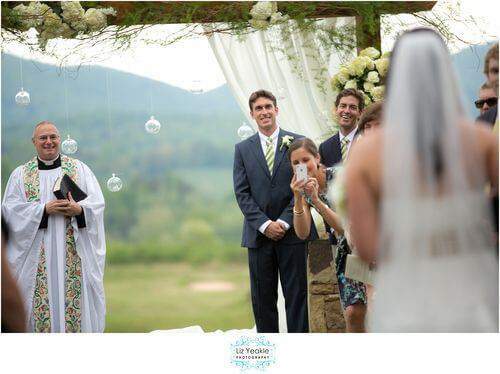 I’m not quite sure when the “instead of enjoying this moment, I’m going to take a picture” mentality kicked in but it has triggered an “unplugged wedding” trend to minimize the chances of obstructing the view of the alter or other non do-over portions of the ceremony. Personally, I think it’s sad that we have to remind people that having your phone out or heaven forbid it actually ringing is something that is undesired. 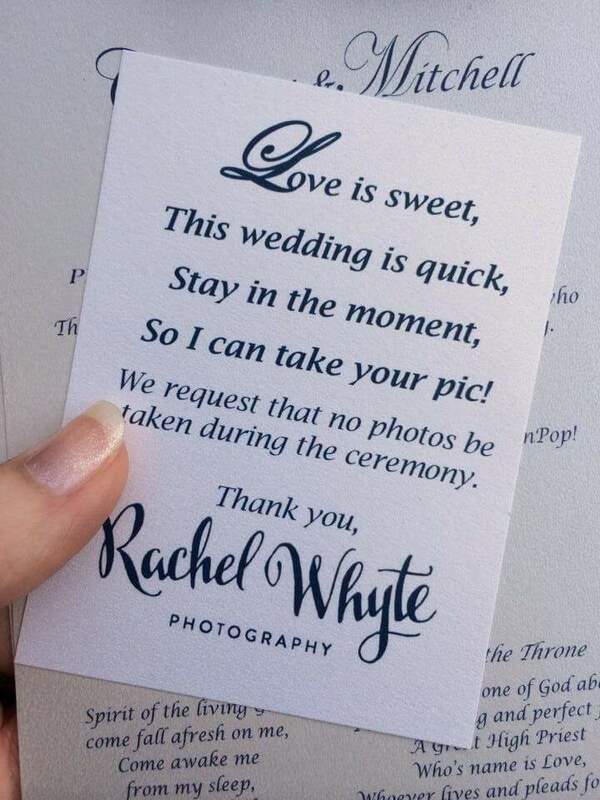 But for those that would like to enforce the rule, the most popular options to display your photo etiquette expectations are by program insert cards, ceremony’s entry signage, or simply having the officiant make a remark before the procession. 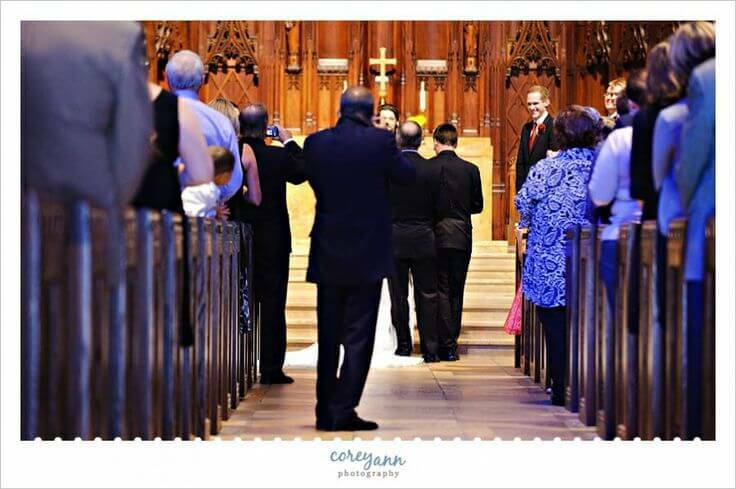 Politely asking guests to refrain from taking photos during the ceremony not only allows them to engage but the photographer will be able to capture beautiful, undisturbed shots that are priceless. 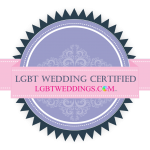 Ultimately our advice is to follow the Golden Rule, you wouldn’t want someone doing any of the above on your special day.